It is a limited-objective form of attack entailing swift entry into hostile terrain. A raid operation always ends with a planned withdrawal to a friendly location upon the completion of the assigned mission. It is not intended to hold terrain. There are many reasons to conduct raids. A patrol might be tasked to destroy key enemy equipment or facilities, temporarily seize key terrain, gather intelligence items, or liberate personnel. While each of these missions differs from the next, they each entail a set of basic considerations. The raid has the same basic teams as the ambush—security, support, and assault. The principle difference is that the raid is conducted on established, stationary targets, whereas the ambush is used on moving or temporarily halted targets. (Source: SUTS2 – The Small Unit Tactics SMARTbook, 2nd Ed. / www.TheLightningPress.com). In a very similar manner as the ambush force, the raiding force breaks down into three main elements: the security team, the support team, and the assault team. 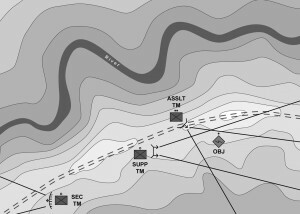 The security team is most commonly deployed to the left, right and sometimes rear of the raiding formation as it is deployed around the objective. They carry rifles, light machineguns, anti-personnel mines and possibly some anti-armor capabilities. Their main purpose is to isolate the target, prevent any enemy reinforcements, and to seal the escape of any enemy running from the objective. The support team is commonly deployed center of the raiding formation in such a manner that they have a clear view of the objective. They carry heavier mass-casualty producing weapons, such as machineguns, grenade launchers, or missiles. This team is primarily responsible for the shock effect, as well as inflicting as many casualties upon the enemy as possible to ensure the success of the assaulting team. The assault team is deployed as closely to the objective as stealth and coordinated fire support allow. They are lightly armed with rifles and carbines but may have special equipment. This team is responsible for the destruction, capture, or liberation of the target. Upon assaulting across the objective, they are also the most exposed—and least armed element of the raid. Raids also have sub-groups within the assault team. Examples of these specialty teams would include grab teams for abduction, prisoner search teams for intelligence requirements, aid & litter teams for wounded, demolition or explosive ordinance disposal (EOD) teams, and possibly even chemical biological radiological and nuclear (CBRN) recovery teams.